Pistol and gear occupying the A zone of an IPSC target. I know I’m not alone in having experienced frustration with reaching a plateau in terms of how fast I could put rounds on target. This is the drill that fixed that problem. Last Friday I provided an orientation to use of the front sight on a very basic level. This next article is for people who’ve mastered front sight focus, and are consistently putting small groups on target as far back as 10 yards. Now, we add some speed to the equation. This drill is the Bill Drill à la DeFoor Performance Shooting. Kyle DeFoor, in his excellent video on this drill, credits Bill Go of Los Angeles Police Department for teaching him (video shown below). There are a handful of different drills out there called “Bill Drill,” this is the one I use. At day’s end, we all stand on the shoulders of giants as we get better at shooting. 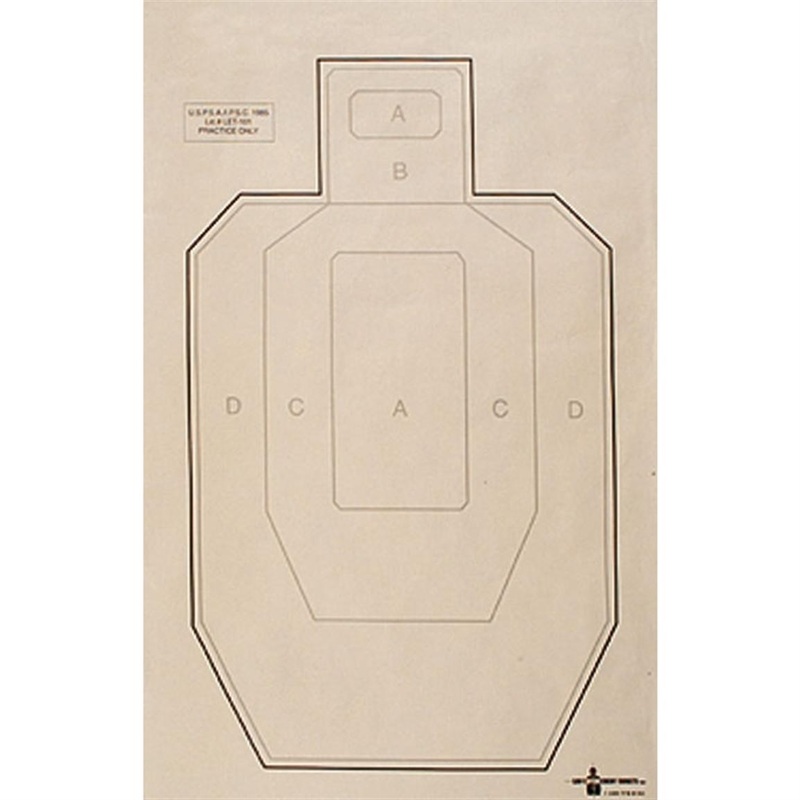 You’ll need an IPSC-style target with a center mass A zone, or just draw a rectangle on your target that’s approximately four inches wide and 11 inches tall. Have ammo in multiples of six. To me, 75 rounds is a good workout for this drill, giving you 13 iterations. 150 is even better. At first, all iterations are done from the standing position, two hands on the gun, at five yards. As you improve, move back to seven, then 10. Load your handgun with at least six rounds. Begin with sights on target, using front sight focus. Count out loud, ONE one thousand. TWO one thousand, THREE one thousand, and so on, up to six. Press the trigger so that a shot breaks every time you say a number. Keep a steady pace by not pausing between shots–your voice should stay in steady, calm action along with your trigger finger. As each shot breaks, watch the front sight. At this stage, it’ll likely disappear from the top end of your field of view. It should come to rest in the A zone as you’re pressing the trigger for the next round. All shots should land in the A zone, though it’s likely the nice tight groups you’re accustomed to may get longish. If some rounds get slung outside the zone, try and feel what you did to cause the error. Often, a too-soft grip and stance are the culprits. This goes for the rest of the phases of the Bill Drill. When you can comfortably and consistently fire six rounds while doing this six-count, keeping all rounds in the A zone, proceed to phase 2. Again, load with at least six rounds. The routine is the same, except rather than “ONE one thousand …” replace the “one thousand” with “and.” So you’ll say “ONE and TWO and THREE and FOUR and FIVE and SIX,” firing a shot each time you say a number. Keeping your eye on the front sight, you’ll see, at this stage, it never has a chance to come to rest on target, it simply travels up and down on a vertical path, and when it’s at the bottom of that path in the A zone, you’re pressing a shot off. It may help to think of your voice leading the action of your finger. Stay at phase 2 until you’re comfortable coordinating the motion of the front sight with your trigger press, keeping all rounds in the A zone. Load with at least six rounds. Now, you’ll only utter “one two three four five six,” firing a round for every number. Keep your mouth and trigger finger moving! The Rate of fire in phase 3 is a lot faster than in phase 1. In phase 3, you’ll no longer be able to keep the front sight in focus. You’ll have developed a feel for keeping it on target without the sharp visual supervision you had before. Welcome to fast shooting! I often break out this drill and go through the three phases in order as the day’s warm-up. In addition to front sight focus, it reminds and rewards me for applying the fundamentals of grip and stance correctly. What do you do to improve you shooting speed? Let us know in the comments below. Thanks! Nice presentation on using this drill to help focus on staying on target. Cool Canik too. 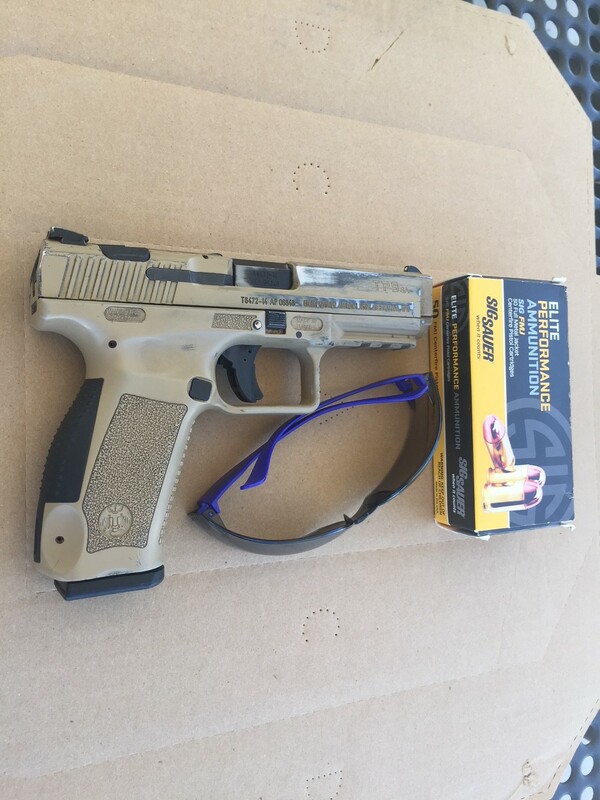 It’s been in and out of dust storms and holsters from the appearance. Thank you. That Canik is a favorite companion. And yes, it’s dusty on the home range. Nice drill. Shot phase 1-3 at 5yds twice yesterday afternoon. Used the 4X11 for the first three mags and found two issues immediately. I was pushing the shots to left side of center and not keeping support hand locked tightly enough “on gun”. Loaded up four more mags, paid more attention to grip and to trigger control and landed all 24 shots, including the last 12 rapid-fire, in a 4” circle. Now I’m ready to move to 7 yds. Great result, thanks for the report!